The process we call learning is in fact a well-orchestrated symphony of thousands of molecular reactions, but the exact interplay between these reactions remains largely unknown. Now, researchers at the Okinawa Institute of Science and Technology Graduate University (OIST) have modelled the molecular basis of learning in the cerebellum, a part of the brain that receives sensory input and coordinates voluntary movements. 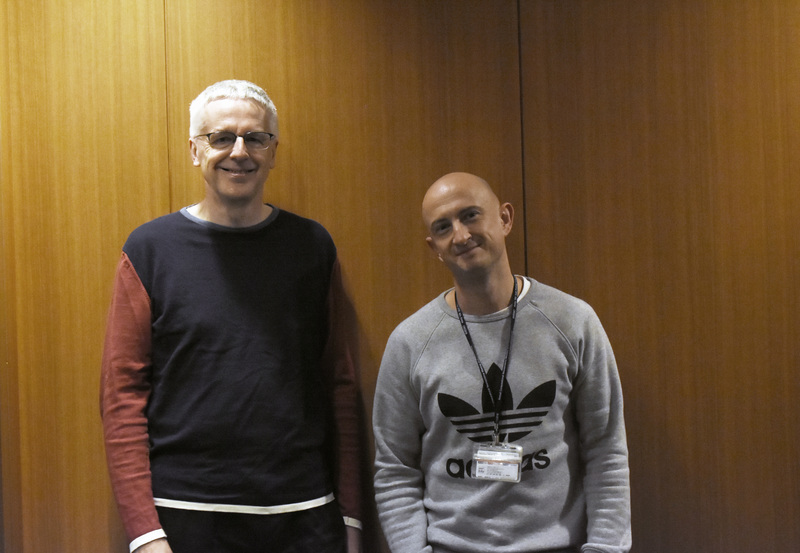 Researchers Eric De Schutter and Andrew Gallimore have modelled the molecular basis of learning in the cerebellum. Learning is thought to be a balance between two processes that act as a kind of molecular dial: long-term potentiation (LTP), in which the connection between two neurons is strengthened, and long-term depression (LTD), in which the connection between two neurons is weakened. Both these processes take place at the synapse—the junction between two neurons. Andrew Gallimore, first author on the paper and a postdoctoral researcher at OIST, modeled how they work in two types of cells: parallel fibers and Purkinje cells, which play a key role in motor learning. Learning is thought to be a balance between two processes that act as a kind of molecular dial: long-term potentiation (LTP), in which the connection between two neurons is strengthened, and long-term depression (LTD), in which the connection between two neurons is weakened. Such a large, comprehensive model allows scientists to examine how complex signaling systems work together. Using a computer program to create a model of this complex system, Gallimore combined several hundred equations taken from experiments in which such neurons were activated. The model was put to the test when colleagues in Korea took recordings from neurons in the cerebellum of mice. The OIST researchers then incorporated these recordings into the model. Their findings show that the molecular networks on both sides of a synapse are important for controlling learning: communication must occur in both directions across the synapse to control whether LTD or LTP is generated during neural activity. 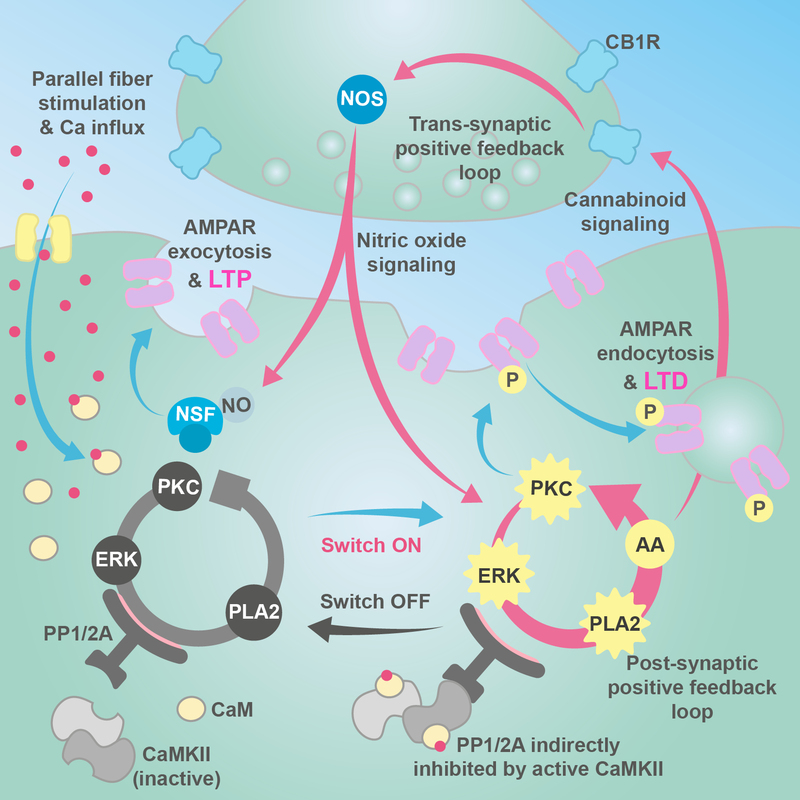 The model also showed that the molecular dial balancing LTP and LTD has an automatic off-switch that, when triggered, allows the system to return to its resting state. Although previous research hinted at the presence of this off-switch, this is the first time that the mechanism behind it—a complex network of proteins and receptors—has been demonstrated. Such a large, comprehensive model allows scientists to examine how complex signaling systems work together, something that is often absent in experimental literature, De Schutter said. The researchers’ work allows scientists to more accurately predict the behavior of the chaotic, complex system of molecules that controls learning. It also hints at what might be happening at the molecular level when these switches break—which might occur when the brain is injured or during neurodegenerative diseases that affect learning.